One of the great perks of working with a great company that produces the "world's most advanced blender" is that we get to partner with great companies and even some of the most elite athletes! 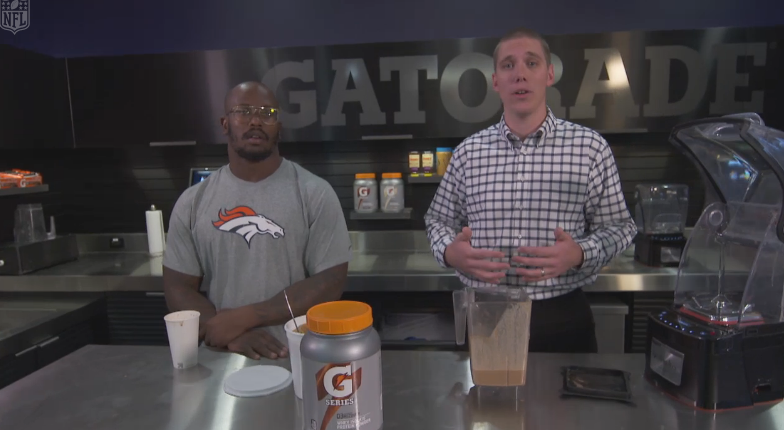 Last month Blendtec announced a partnership as the Official Blender of the Gatorade Fuel Bar, and just this week NFL UP featured Denver Broncos All-Pro Von Miller getting his smoothie on at the team's Gatorade Fuel Bar using Blendtec blenders! NFL and Denver Broncos All-Pro Von Miller gets his nutrition from the Gatorade Fuel Bar using Blendtec's Stealth blender! Each Gatorade Fuel Bar includes three top-of-the-line Blendtec commercial blenders that can be used to make healthy shakes combining fruit, yogurt and Gatorade protein powders designed specifically to support competitive athletes’ nutrition needs. Gatorade Fuel Bars have already been installed at 18 team facilities to date, including the Buffalo Bills, Chicago Bears, Chicago Cubs, Chicago Bulls, St. Louis Rams, Cleveland Browns, Denver Broncos, Jacksonville Jaguars, New Orleans Saints, New York Jets, Pittsburgh Steelers and Washington Redskins as well as at Duke University, University of Florida, Michigan State, Notre Dame, Ohio State, Oklahoma State and the Brazil National Football Club. The Blendtec Stealth blender, being deployed in the Fuel Bars, is the world’s quietest and most advanced commercial blender, with the ability to make 20 smoothies per machine in 10 minutes courtesy of automated blend cycles, a Blendtec WildSide+ jar that can fit two large smoothies simultaneously, and an industrial-strength 15-amp, 1875-watt, 3.8 peak horsepower motor. Hi! We can not configure Blendtec CHEF775 into Multipurpose 2 Profile. I press buttons Cancel – Medium – Large according to your instruction, but it does not work.I tried to hold this combinations of buttons Cancel – Medium – Large for 2,5 sec. with 3 fingers, and also pressed one after one – no results. Thats why I can work only Multipurpose 1 Profile … Model of my blender is CTB1, serial # 100322. Please make video instruction, it will help users Blendtec CHEF775.